Political parties like to pretend they own votes, but they don't. The SNP proved that on election night. The first-past-the-post electoral system used to elect the UK government is archaic and unfair. I've said so myself, as have many others. In our fully justified railing against the system, it's easy to lose sight of the fact that we still have a vote. The UK is a democracy, however dysfunctional. Parties say past elections and opinion polls determine the future. They make claims like "only we can beat That Other Party in this seat". They openly ask for tactical votes, from anyone who dislikes them less than their opponents. 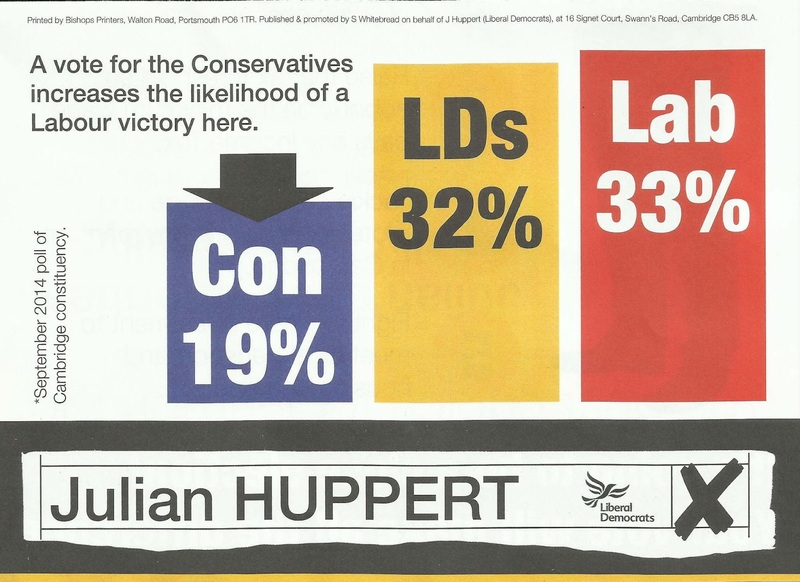 The example below was put through my letterbox in Cambridge, and it's far from the worst I've seen. 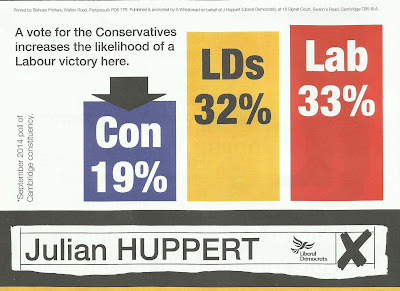 Strictly speaking, and with all due respect to Julian Huppert, this is not true. There is no such thing as a marginal seat, or a safe one. There are only parliamentary seats. I've never stood for election myself; but I have gone hitchhiking, and I imagine some similarity. You make yourself visible, stick out your thumb, and hope for the best. Candidates should know this, somewhere in the pit of their stomachs. In leafy Huntingdon, you might be standing for the Conservatives, assured of victory; or for the Revolutionary Communists, facing almost certain defeat. And yet, and yet... you don't know for sure. Not until the votes are counted. Upsets do happen. You think that's a naive abstraction? A platitude to make the voters shut up and do as they're told? The SNP proved otherwise. In taking on Scottish Labour, they faced the very definition of safe seats. Gordon Brown's former seat of Kirkcaldy and Cowdenbeath had been held by Labour since 1935. In 2010 Brown secured 64.5% of the vote, while his nearest rival had 14.3%. Three weeks ago, it fell to the SNP. The SNP came from second, third, even fourth place to victory. Winning in 2015 after placing fourth in 2010 was not a one-off. By my count it happened in ten seats: East Renfrewshire; Berwickshire, Roxburgh and Selkirk; East Dunbartonshire; Edinburgh North and Leith; Aberdeen South; Edinburgh South-West; Edinburgh West; North-East Fife; East Lothian; Argyll and Bute. The SNP won them all. The SNP swept away MPs with formidable reputations, some of whom had held their seats for decades. Here's a remarkable thing: Now that these candidates are voted out, they have gone. Peacefully. Not a drop of blood has been spilled. It's very easy to take that for granted. I've heard a lot of careless talk about how evil the British state is. From the other side of the fence, I hear a lot of platitudes about British values. It's almost enough to give British values a bad name, but not quite. A case in point is the defeat of Douglas Alexander. He was one of the three or four most powerful people in the Labour Party. If Labour had won, he would have been Foreign Secretary of the UK. He lost his seat to Mhairi Black, a politics student at Glasgow University. 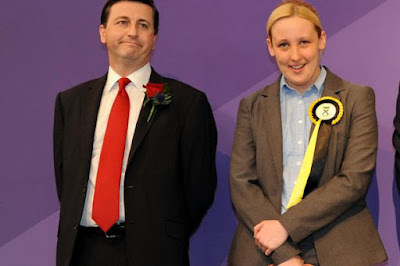 Douglas Alexander (left) and Mhairi Black (right) as the result was announced. This is what British values mean: When a senior politician loses an election to a student less than half his age, he gives a polite speech wishing her well, and walks away. Brave men and women have fought and died to give us that capability. Others have been perfectly happy to kill and maim to keep it out of our hands. Some enemies of democracy wore the uniform of a foreign army; others were inside the UK. All of them failed. We have the power, if enough of us decide to use it. I have plenty of differences with the SNP, but credit where it's due. On election night, they reminded us of this truth in spectacular fashion. For that alone, I'm raising a glass of single malt whisky to them tonight. Slainte.